I've have won the second place in Shama's Event "Payasam and Kheer Festival". I sent her totally seven entries and those entries fetched me this award. I'm really happy to get this award. Thank you so much Shama. Congratulations Nithu on your award. Well deserved. Happy to see you, after my short and lovely vacation. Congrats on your well deserved awards. My Heartiest wishes for your many more sucess that is on your way. Happy Earth Day and Congrats on your awards. Speaking of awards, I will accept urs in a couple of days dear. Very nice of you to send customized awards. I am honored. Good night! wow !! very well deserved...congrats dear..
Catch You soon. Going to mom's place for vacation for 10 days. Congrats!! Hope your system gets fixed soon.. All the best. Congrats on ur Awards dear,,,well deserved dear..
Congrats on winning Nithu dear! Congrats Nithu, will surely miss u...hope ur system will work out properly soon..will definitely miss ur delicious dishes for the sure..
Congrats on your awards..7 Kheer recipe great yaar..Keep up the spirit !!! 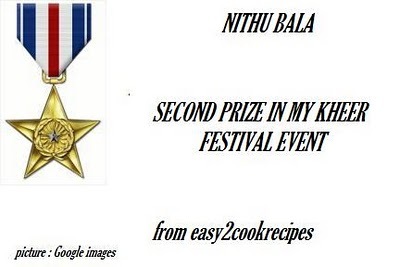 Congrats on your award Nithu..
Congratulations nithu .We will be missing your lovely recipes n posts. Congrats Nithu and you deserve it!